This is my research into the history of the Irish Terrier mascots at Notre Dame and my conclusions may not be perfect, subject to continuing research, but the information contained here is more accurate than anything published to date. Stories and articles that have appeared in the Notre Dame Scholastics, Domes, football programs and football guides or reviews have sometimes been inadequately researched and therefore contain more fiction than fact. Sad to say the personal recollections of past Notre Dame administrators and sports personnel concerning Irish Terriers as mascots are often more fanciful than precise. Thanks to David Sparks and Jethrow Kyles at the Hesburgh Library at Notre Dame. Their help in my research has enabled me to sort out the truth from much of the fiction. Thanks to Donn Gregori whose artistic work graces the cover and the inside back page of this booklet. Thanks to Dr. Bernard “Bud” McGivern. Bud was a cheerleader and handler of Clashmore Mike when at Notre Dame in the mid 1950’s. Bud is a member of the prestigious Westminster Kennel Club of New York City, and has enlisted their support in our reinstatement campaign. Thanks to Tipperary Terrence I. You were the first and as such I have a very personal and special fondness for you. Go to St. Peter and tell him I said to give “St. Patrick’s Pal” a special bone treat. Thanks to one and all! Now let’s read the greatest success story ever written about a college mascot—the Irish terriers of Notre Dame. Classic portrait of Clashmore Mike II with his "game face" on. Chapter One: WE ARE NUMBER ONE! I guess it is only fitting and proper that Knute K. Rockne, the greatest of all college football coaches, should have selected an Irish Terrier dog as the mascot for the University of Notre Dame’s football teams. The “Rock” won 105 games while at Notre Dame and compiled an .881 winning percentage. That ranks Rockne number one amongst all college football coaches who ever coached according to the NCAA. In 11 of his 13 seasons coaching he suffered no more than one loss in any season. Six of his teams were selected as National Champions, and Rockne was inducted into the National Football Foundation Hall of Fame in the first year of its existence. Chapter Two: Why an Irish Terrier at ND? The answer to why the “Rock” selected an Irish Terrier as mascot is open to more definitive research. Rockne had a house pet dog by the name of Noxie, and it was a German shepherd. Legend has it that Noxie knew or felt the loss of his master at the exact time Rockne’s plane crashed into a Kansas wheat field on March 31, 1931. Since Rockne did not leave us with an answer as to why he selected the Irish Terrier, let me try to answer that question. The Irish Terrier dog and the University of Notre Dame share much in common. They both acquired their lofty status the hard way—they earned it! They both are instantaneously recognizable—one by its magnificent Golden Dome and the other by its classic sculpturesque profile. They both are honest, loyal and loving. They both instill in their supporters an almost fanatical devotion. The word charismatic is meaningless when applied to anything other than Notre Dame and the Irish Terriers. Finally, never doubt for one moment—both are Fighting Irish! The union of the University of Notre Dame and the Irish Terrier dog is as relevant today as it was in 1924 when Knute Rockne selected it as the Notre Dame mascot. “The Irish Terrier is perhaps the finest dog on earth. He does not throw away his priceless devotion and loyalty on every stranger who may chirp to him. But to the death he is the comrade and protector. There is no mascot for any college or university which is better suited or qualified to represent Notre Dame than is the Irish Terrier. For approximately 42 years the Irish Terrier was the mascot for Notre Dame football teams. During that time Notre Dame won 12 National Championships in football. The Irish Terrier is the “winning-est” mascot a college football team ever had, and it hasn’t been active in over 20 years. After the Army game the Notre Dame football team went on to an undefeated season (10 wins and 0 losses), and the 1924 Collegiate Football National Championship. The 1924 football team is considered by most sports writers the most acclaimed team ever assembled. In addition to the Four Horsemen (the backfield) the team had the famous Seven Mules (the lineman). The 1924 National Champions and '25 Rose Bowl victors. Layden is holding his pal Tipperary Terrence II, front row center. After the completion of the regular football season Notre Dame agreed to play Stanford on January 1, 1925 in the ninth annual Rose Bowl contest in Pasadena, California. Before the game, the Notre Dame team posed for a team picture. There, front row center, is one of the Four Horsemen, Elmer Layden holding Tipperary Terrence II. Notre Dame beat Stanford 27 to 10 in that Rose Bowl. Now who do you think was the star of that game? Why of course, the holder of the Irish Terrier mascot—Elmer Layden. He scored three touchdowns on runs of 3 yards, 78 yards (interception return) and 70 yards (interception return). From that day forward Elmer Layden was one of Notre Dame’s biggest supporters of the Irish Terrier mascot. During Rockne’s last six years the ND football teams earned three more National Championships and the legend of the Irish Terrier mascot grew. 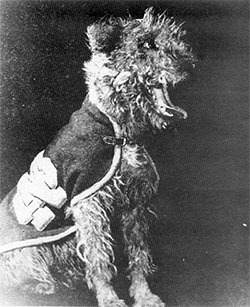 Football programs began to picture the terrier mascot. On October 17, 1925 in Yankee Stadium the Army squad squared off against another Notre Dame team. 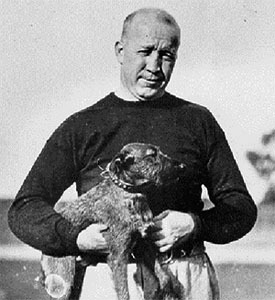 In the program is the all time classic picture of Coach Rockne holding the Irish Terrier mascot. An all-time classic picture of Knute Rockne with Tipperary Terrence II. On October 30, 1926, Georgia Tech played at Notre Dame, and on page 26 of the program is the Notre Dame football team posed with its Irish Terrier mascot. The Southern California vs. Notre Dame program for the November 16, 1929 game at Soldiers’ Field in Chicago has a picture of the ND team with its Irish Terrier mascot in the first row. On March 31, 1931, the “Rock” was killed in a plane crash in a farmer’s field in Kansas. The fate of Tipperary Terrence II for the time being is lost somewhere in annals of Notre Dame publications. Rockne wouldn’t go to his heavenly reward, however, and leave us without an Irish Terrier mascot. Sometime before the November 8, 1930 football game against the University of Pennsylvania the “Rock” accepted from Charles Otis and Thomas Bolton of Cleveland, Ohio a new mascot. This dog was named Brick Top Shuan Rhu. What a great start for Shuan Rhu. Notre Dame crushed one of the top Eastern schools, the University of Pennsylvania, by a score of 60 to 20. Notre Dame rolled up 557 yards in total offense to only 73 yards for Penn. Starting with the 1934 season, Elmer Layden, one of the Four Horsemen, became the football coach at ND. Layden was a student was a friend of the terrier mascot. So it should be of no surprise to anyone that the Irish Terrier mascot rose to a level of prominence during his coaching tenure. His son Elmer Jr. remembers as a boy seeing the mascot running and playing in their backyard on Lincolnway East in South Bend. This was probably the Golden Age of the Irish Terrier mascot. Coach Layden is apparently the one who re-named the mascot Clashmore Mike. The first known full time handler of the mascot was a gentleman by the name of Dan Hanley. Dan came to Notre Dame in 1927. He was born and raised in Houghton, Michigan which was also the home town of the legendary George Gipp. Clashmore Mike with his handler Dan Hanley. Dan and Clashmore Mike I were inseparable friends. Dan was a bachelor and he lived in a neat little room in the gym for which he was the caretaker. Clashmore Mike I was seldom away from his side. Back in the late 1930’s and early 1940’s it was a common sight to see the genial white-haired man walking across the campus with Clashmore Mike I scampering before him with the tinkling of a little bell around his neck informing everyone of their whereabouts. These two legends of Notre Dame were truly close friends. When it came time for them to pass on they went out together inseparable to the end. “Two familiar figures were absent from the Notre Dame football scene this year. One was scrappy little Clashmore Mike, the spunky Irish Terrier, who, as team mascot for the past decade, had captured the attention of football fans throughout the nation. On Monday September 7, less than two weeks before the 1945 grid season opened, Mike’s body was found on the campus by a caretaker and buried in the Notre Dame stadium where the mascot had begun his illustrious career. Layden and the Notre Dame Athletic Department in the 30’s and 40’s obviously saw the positive public relations aspect of an Irish Terrier as a mascot. Clashmore Mike posed for pictures in newspapers, football programs, Domes and Scholastics. Clashmore Mike even had his own sports column in football programs. This was the era when photographers from the big city daily newspapers in New York, Chicago, Baltimore, Cleveland and Philadelphia showed up to get pictures of Clashmore Mike taking off after the Army mule or the Navy goat and chasing them off the playing field. From 1936 through 1949 every home football program at Notre Dame had some sort of picture, article, cartoon or drawing of the Notre Dame Irish Terrier mascot. 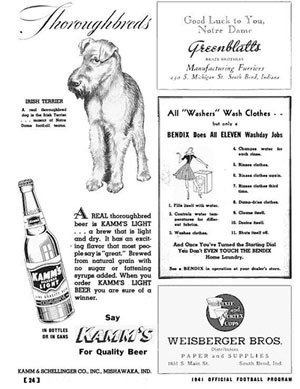 A Kamm's Brewery advertisement from 1941 featuring Clashmore Mike. In the November 7, 1936 program for the Navy vs. Notre Dame game in Baltimore there is a very attractive pencil sketch of the head of an Irish Terrier dog on those pages where there are pictures of Notre Dame players. When Clashmore Mike I died he was afforded the singular honor of being buried under the turf of Notre Dame stadium. Legend has it that if you listen and watch very closely at home football games when the leprechaun mascot dances over Mike’s gave you can hear a low throaty growl, and the grass over the grave stands straight up. Next time look and listen for it and you decide whether the legend is authentic. All lovers of the Irish Terrier mascot at Notre Dame owe a deep and continuing debt to Elmer Layden. This was the Golden Age of the Irish Terrier mascot at Notre Dame. Thanks Elmer! I hope you, Dan Hanley and Clashmore Mike are now reunited above with the “Rock” and Tipperary Terrence I and II in heaven above. Frank Leahy, also known as “The Coach” or “The Man,” compiled a winning percentage of .864 in college football. That ranks “The Coach” as number two behind Rockne for winning percentage. Over his career from 1939 through 1953 he won 107 games while losing only 13 and tying 9 games. Leahy coached at Boston College in 1939 and 1940 before returning to his alma mater in 1941. 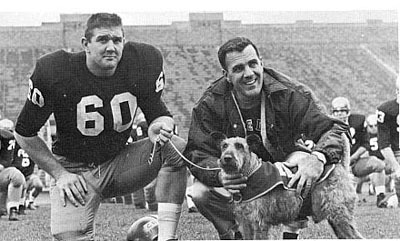 While at Notre Dame Frank had six undefeated teams, five National Championships and an unbeaten string of 39 games, and the Irish Terrier mascot was there for all of it. “That Irish Terrier mascot was the toughest and most active dog I ever saw. I remember one day at practice Clashmore Mike and I were both on the sidelines. I decided to go up to Mike, say “Hello,” and give him a pat on the head. I called his name before I reached for him. He set his jaw firmly, fixed his deep brown eyes in a menacing glare and the hair on the back of his neck stood tall. I don’t know what he would have done, if I had moved my hand to touch him, which I didn’t do. After that I gave Clashmore Mike a wide berth. 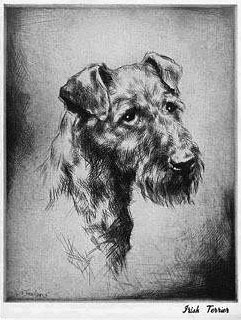 Pencil sketch from 1936 Navy program featuring an Irish Terrier. What was mascot Mike’s life like at Notre Dame? Well, through 1945 he lived in and around the old gym. Although he had an outdoor dog house (painted green) he was often in the fieldhouse with Dan Hanley. Apparently over the years Dan had problems with Clashmore Mike’s diet because students often fed him table scraps from the dining hall. In addition Mike had a sweet tooth and the students got into the custom of feeding him candy. Mike was not caged and more or less had the run of the campus. He at times failed to come back to the gym for his daily ration of dog food because the students fed him. Thus, Dan Hanley in a 1944 issue of The Scholastic pleaded with the students to not feed Clashmore Mike. It appears Mike was a traveler and got to go to many of the road games. We know for sure he got to visit the cities of New York, Cleveland, Philadelphia, Chicago, Baltimore, Los Angeles, Minneapolis and Pittsburgh. A dog’s life it wasn’t. Knute Rockne, Elmer Layden and Frank Leahy won a total of 239 games, lost 36 and tied 17 for a percentage of .848. 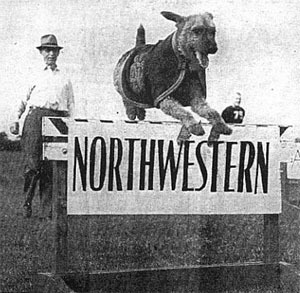 From 1924 through 1953 there were 10 National Championships and the Irish Terrier mascot was a proud part of all of it. Knute, Elmer and Frank considered the Irish Terrier mascots as much a part of the traditions and legends of Notre Dame as George Gipp, the Golden Dome and the Victory March, and the Irish Terrier mascot rewarded that confidence by being around while ND was winning an astonishing 85% of its games. What a record! Coach Frank Leahy was forced to resign after the 1953 football season because of poor health. Following Leahy was everyone’s All American Terry Brennan (1954 -1958) who compiled a .640 winning percentage while coach at Notre Dame. Terry was replaced by Joe Kuharich (1959-1962) who has the dubious distinction of being the only Notre Dame football coach to have a losing record (.425). After Joe, while Notre Dame tried to figure out what happened to their football program, Hugh Devore was named interim coach for one year. Hugh had served in that capacity once before in 1945 while Frank Leahy was away in military service. I wish it could be said the Irish Terrier mascot was not around during some of these lean years, but the truth of the matter is the mascot suffered through this dark period along with all other Notre Dame fans. That is not to say, however, there were not some thrilling victories and excellent teams. Terry Brennan’s teams in 1954 and 1955 had 9-1-0 and 8-2-0 records respectively. His 1956 team was 2-8-0 and had suffered a 40 to 0 loss to Oklahoma at Notre Dame, ND’s worst defeat ever at home. In 1957 Oklahoma was a prohibitive favorite to win with the game being played at Owen Field, especially since the Sooners had a 47 game winning streak. That streak which is still the longest ever, was ended that day. Notre Dame won 7 to 0. Tipperary Terrence II showed up during the 1924 season and the Notre Dame team won the Rose Bowl, Collegiate Football’s National Championship and Four Horsemen backfield. The coach was Knute Rockne—the winning-est ever. National Championships also followed in 1927 and 1929. Next came Brick Top Shaun Rhu before the 1930 game against the University of Pennsylvania. That day they beat a strong Penn team 60 to 20. That was another National Championship. The 1931 Dome wrote about that game. “It was the most decisive trouncing that the Irish has handed out since the team stopped playing teachers’ colleges a number of years ago.” The 1929 and 1930 teams were “his best teams ever” according to Rockne. Next comes Clashmore Mike I in 1935 and Notre Dame beats Ohio State in that fabled, unbelievable comeback. National Championships are achieved in 1938 and 1943. Another Clashmore Mike or two were regular members of Coach Leahy’s teams of 1946, 1947, 1948 and 1949 when there was not one defeat suffered by Notre Dame football teams, and the Irish won three more National Championships. Johnny Lattner led the 1953 team to a National Championship by dodging tacklers and Clashmore Mike alike. When Oklahoma’s streak of 49 unbeaten games (the longest ever) was chewed up in 1957 Clashmore Mike was the Irish mascot. Coach Parseghian with Captain Jim Carroll and Clashmore Mike II. In Ara’s first year of 1964 there was another National Championship. Finally, when Ara Parseghian’s 1966 team slaughtered the USC Trojans 51 to 0, and were acclaimed the “best ever,” Mascot Mike was the Irish’s lucky charm. This was another National Championship team. That was the end of the line for college football’s “winningest” mascot with 12 National Championships earned while the Irish Terrier dog was at Notre Dame. He was to be replaced by a registered trademark on paper of a leprechaun in a fighter’s pose. Who in their right mind would make the mistake of trashing our beloved Irish Terrier mascot?